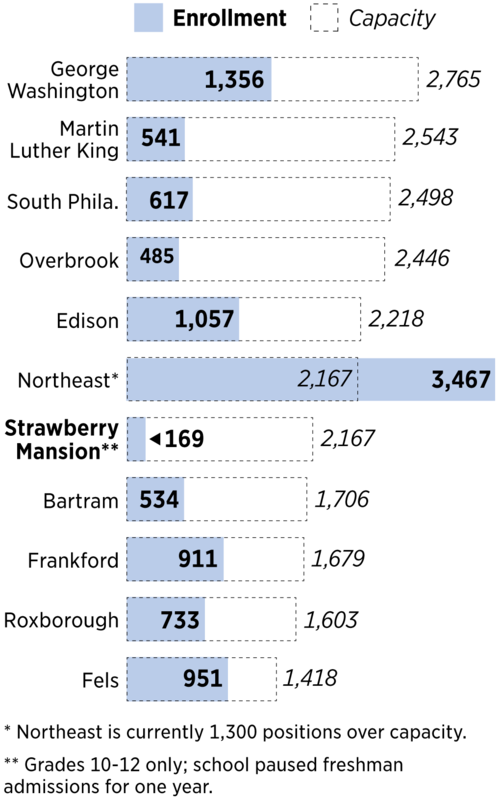 At Strawberry Mansion High, just 169 students attend a school built for 1,800. It has a new principal, promises of support, and an outsize place in its students’ lives. Still: Can it survive? The morning sky was still dark when Charnel Crockton left the homeless shelter where she lives, swinging the steel-and-glass door open onto a cold December day. No one spoke to her as she trudged past the day-cares and salons of Germantown Avenue to catch the K bus and then transfer to the 61, which let her off at Ridge and Dauphin, just past the edge of Fairmount Park in North Philadelphia. After a short walk past rowhouses, a Malcolm X mural, and an empty, trash-strewn lot, she reached her destination, the back door of Strawberry Mansion High School, just before 7:30. Crockton had come north to Philadelphia 18 months earlier, after Hurricane Irma left her family homeless. Her school in Florida, South Lake High, had 26 sports teams, dozens of clubs, and a lot of rules. Mansion, as it’s known, was vastly different when she enrolled. Built decades ago for 1,800 students, the cavernous structure that occupies an entire city block at 31st Street and Ridge Avenue had become a shell of what it once was. Five years after Diane Sawyer showcased it on TV as one of the nation’s “most dangerous” schools, Mansion was on life support. A handful of students work in the computer lab during a Microsoft Office class at Strawberry Mansion High School. In one Philly neighborhood, critics ask: Is gentrification closing our high school? Strawberry Mansion HS, nearly empty, is being phased out. What's next? The five-floor brick-and-concrete building in the neighborhood of the same name — highest in the city for homicides and shootings, according to police data — is attached to a shuttered elementary school. At Mansion’s peak, all five floors were bustling; now, it uses parts of just three. When the student body gathers in the auditorium or gym, the space feels too large. Last spring, Philadelphia School District officials presented plans to phase out the comprehensive high school. After a community outcry, they agreed to use this school year as a planning period, pausing ninth-grade admissions while they figured out how to attract more students in 2019, and vowed to give the resources and time needed to do so. The reasons behind Mansion’s decline run deeper than one neighborhood, one district, even one city. And its plight is emblematic of a larger phenomenon: how traditional urban public schools often struggle to survive in an increasingly competitive educational marketplace. 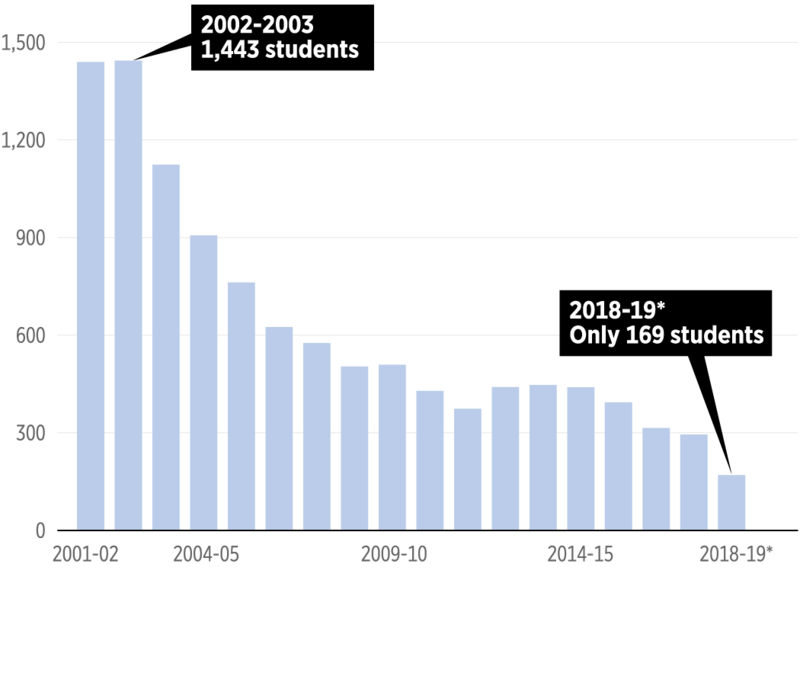 The student body has declined from a high of 1,443 in the 2002-03 school year to only 169 this year. *Grades 10-12 only; school paused freshman admissions for one year to plan a transformation. Over 20 years, the school-choice movement has upended educational landscapes across the country. Scores of charter schools have opened in Philadelphia, and to keep up, the district has dramatically expanded its high school offerings. As a result, neighborhood high schools like Mansion have shrunk and struggled, their students often the ones without options. Every student at Mansion is considered poor; most are black. 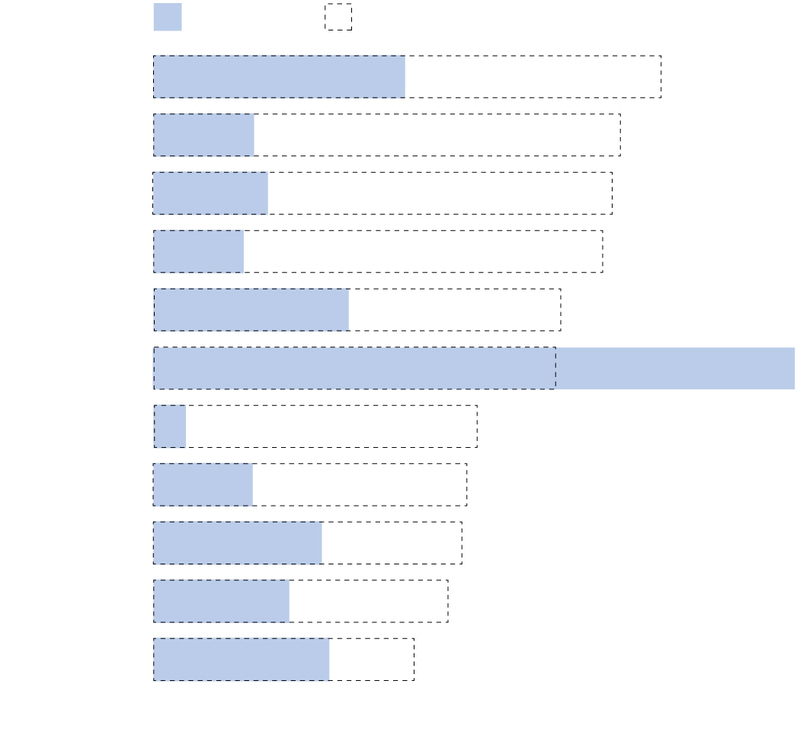 Two in five require special-education services. Some have been kicked out of charters, spent time in the juvenile justice system, or don’t have parents to fight for them. Many are coping with trauma or mental health needs. On paper, it might make sense to close a school enrolling just 169 10th through 12th graders in a building the size of a factory. But that ignores the school’s outsize place in its students’ lives, and the work being done within the building to change the school’s trajectory. As Mansion fights to reinvent itself, an Inquirer reporter and photographer have spent months in the school — with plans to continue chronicling its fate as it reaches a crossroads. For now, Mansion has grabbed a lifeline. A dedicated new principal is working to infuse the school with spirit and student voice; staffing levels are enviously high; and Mansion can count one of the city’s most influential elected officials as a key ally. “Forever Mansion” reads one school uniform shirt, white letters edged in red against a black background. But with daunting odds — Mansion scored just 7 out of 100 on the school system’s rating scale last year, and almost no students passed the state’s biology graduation exam — a question mark might be appended to that slogan. Those hoping for a turnaround might look to students like Crockton, who not long after she first arrived in Philadelphia thought Mansion’s closing might be a good idea. This year, she has grown to treasure her school. In her backpack she carries her transcript, with its neat rows of mostly A’s and B’s, and Crockton dreams of heading to Indiana University of Pennsylvania in the fall. At one point, her mother planned to send her back to Florida, but Mansion staff intervened and found her a spot at a Germantown youth shelter. Charnel Crockton, a senior at Strawberry Mansion High School, does homework in the room she shares with three other young women at Covenant House Pennsylvania, a youth homeless shelter in Germantown. Crockton’s face was impassive that December morning as she traveled to school from the shelter. Then the school nurse passed her, and the 19-year-old’s demeanor transformed. For the first time that day, Crockton smiled. A page from Strawberry Mansion High School's 1977 yearbook. Mansion opened in 1964 as a junior high and became a high school in 1977, around the time James “Torch” Lytle came to work in its public schools. The school’s classrooms were near capacity in the 1980s. Though “never a lighthouse school in any way,” according to Lytle, who served as a district administrator and is now a professor at the University of Pennsylvania Graduate School of Education, the school had its sources of pride: a standout basketball program, a run of science-fair champs, vocational programs, a sense of community. But Mansion competed with more well-established schools, like Ben Franklin, Dobbins, and Gratz, and began losing students in the 1980s to a school desegregation program that allowed African American students to attend better-performing schools farther from their homes. Mansion’s enrollment steadily shrank, and in the early 2000s, it landed on Pennsylvania’s list of “persistently dangerous” schools, based on the number of serious violent incidents. Programs were implemented, then set aside when the district’s funds and attention waned. Yet, for some kids, it was still a lifesaver. Counselor Ameera Sullivan gives a hall pass to sophomore Jahmod Williams, right, after he took a school district career questionnaire in her office at Strawberry Mansion High School. Junior Imani Pettyjohn, left, works on the online questionnaire. When she was still a girl herself, Ameera Sullivan took care of her five younger siblings in a rough neighborhood — she grew up not far from Meek Mill, the rapper and onetime Mansion student. Sullivan was smart and motivated, but family members struggled with poverty and drug addiction. She spent time in foster care, and as a freshman at Mansion became pregnant. Sullivan was 14 when she delivered her daughter. She named the baby Sameera and resolved to persevere with her education. She took advanced classes, was a cheerleader, and played volleyball; her math teacher saw her promise and got her into a summer program that paid her to learn computer programming. “The educators who taught me refused to let me fail,” Sullivan said. She graduated in 2006. By then, the forces that had emptied Mansion were also affecting other neighborhood schools around the city, and would continue to do so. In 1981, Philadelphia had 225,000 students enrolled in 273 public schools, all run by the Philadelphia School District. Now, it has 205,000 spread across 307 schools, 220 run by the district and 87 publicly funded but privately managed by charters. Bartram High, in Southwest Philadelphia, was built for 1,700 students and now has 534. Overbrook, which can fit almost 2,500, has just 485. Even Roxborough, which is fuller by comparison, can hold 1,603 and has 733. Chicago and other cities are grappling with the problem, too. Strawberry Mansion High School has fewer than 200 students attending school in a building designed to accommodate more than 2,100 pupils. * Northeast is currently 1,300 positions over capacity. ** Grades 10-12 only; school paused freshman admissions for one year. Charter operators market their schools as more appealing than the struggling schools they compete with, said Jerusha Conner, a Villanova University education professor who researches student engagement. Schools like Mansion were neglected, underfunded, and penalized by local, state and federal officials for years, and families that can figure out how to work the system do so, leaving Mansion and schools like it with the most fragile students. “Mansion is what remains of a tattered educational safety net," said Conner, who has worked with Mansion students as part of a course she teaches. The school was one of 53 in Philadelphia under a microscope for possible cheating on state standardized tests in 2009, and the district attempted to close it in 2013, when officials shut dozens of schools with poor academics and low enrollment. Community pushback and intervention from City Council President Darrell L. Clarke, an alumnus, staved off shutdown then, and officials pledged improvements for the school. But success was elusive, even under Linda Cliatt Wayman, a principal whose five-year tenure brought leadership stability, more programs, and national attention. Sullivan, the 2006 graduate, went on to collect two college degrees. In 2016, she returned to Mansion as a counselor. Students walked the same halls she had, but it felt different: fewer things for students to do, hundreds fewer pupils, more student and teacher mobility, more turmoil. Shawn Bird, the district’s chief schools officer, saw the problems when he walked into Mansion on the first day of the 2017-18 school year: disengaged students, teachers in over their heads, and a lack of programs. To survive, the school needed dramatic change. On a Thursday afternoon in February, the Mansion boys’ basketball team faced Overbrook in a playoff game. In the gym were something not taken for granted at Mansion: fans — cheerleaders and students, but also teachers, family members, people from the community. After Mansion’s depleted football team folded after three games last season, a spirited but inexperienced volleyball squad became the school’s only fall sports team. Basketball became a rallying point. The first-round playoff game with Overbrook was tense, with the lead seesawing and Overbrook pushing the game into overtime. When Mansion won, 65-61, it was as if the Knights had collected the city championship: The crowd poured onto the court, with hugs, high-fives, and cell phone recordings of the joy. The team doused coach Myles Huggins with ice water, and no one wanted to leave the gym after the game, even as police officers milled about to keep order. 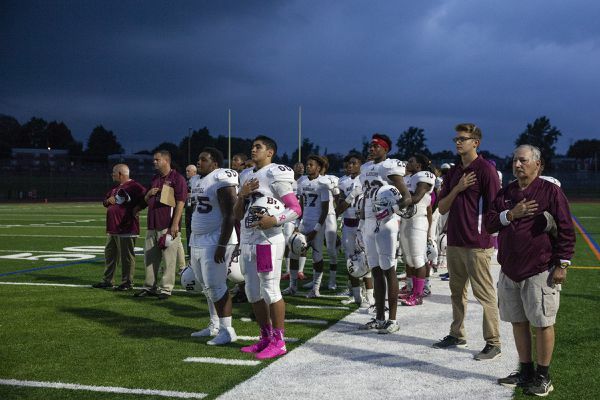 Off to a corner, first-year principal Brian McCracken took it all in. Students have to feel like they belong to something for a school to succeed. McCracken is focused on the future as a chief architect of Mansion’s next phase, but also is determined to give current students a traditional high school experience. Watching the euphoria was a real moment for him. McCracken, 32, grew up on a farm in Plymouth Meeting and attended Quaker schools. He routinely works 12-hour days, and wanted the Mansion job, he said, “to work with the community to rebuild, to provide whatever I can to students that have more drive and resiliency than most adults. No matter what it takes, if other schools have experiences, we’ll provide access to them, too." This year, there’s Knights Council — a student advisory board — and Knights Club, a monthly trip for kids who excel in attendance, behavior, and scholastics. There are college trips, motivational speakers, and a burgeoning program to draft community men to mentor Mansion students. The school leadership believes celebrations are important, so they build them in — a holiday party before winter break, a Valentine’s dance one Friday before dismissal. “We can’t treat kids like prisoners, because they’ll act like prisoners,” said Sullivan. Students have noticed the efforts at “re-culturing” the school — not just calming it, but making it a place students want to be. Junior Daemeria Gaskin heard scary things about Mansion before she arrived freshman year, and the school lived up to its reputation. Last year, there seemed to be no rules, and a lot of teachers gave up, she said; the principal between Wayman and McCracken was rarely seen, and left abruptly after less than a full school year amid concerns about his leadership. Sometimes, kids would throw things — a fan, books, a chair — out of windows just because they could. Seniors Imani Moses, left, and Nada Dickey, prepare to eat chicken wings and fries they made in their culinary class at Strawberry Mansion High School. Students in the course learn hands-on about food preparation and culinary techniques, taught by first-year teacher and chef Joy Parham. “Now, it’s different, and we’ve got more programs: music, culinary, internships. There are things to do. We have smart kids, and there’s people who care, who want to see you do your work, see you do good and go to college. If you need clothes, shoes, anything, the teachers will get you whatever you need,” said Gaskin, 16. She takes one of Mansion’s two virtual Advanced Placement courses, and scored a paid internship in a coffee shop. One winter day, Gaskin sat in Room 304 for English 3. The class was quiet save for the click of computer keys and the low voices of junior Wayne Cooper and their teacher, Analia Del Bosque. That day, she had 22 teens on her roster, but just six in class (some were absent and others were at a school event). It’s one of the benefits of a school with such low enrollment: At Mansion, one-on-one attention is the norm. “DB,” as she is known — a second-year teacher loved by the students — had assigned her class a 500-word personal narrative, and given them laptops and time to write. Sophomore Tykeria Perry, left, talks with English teacher Analia Del Bosque about her check-for-understanding exam before class at Strawberry Mansion High School. By the middle of the period, a few students had strayed, starting to talk loudly. Others were lost in their phones, still a frequent battle at the school. Mansion students’ life experiences often bleed into their academics. They tell trusted adults they feel scared to take tests, judged. And many must take accelerated, online “credit recovery” classes along with their regular course load because in prior years, classes were assigned haphazardly. 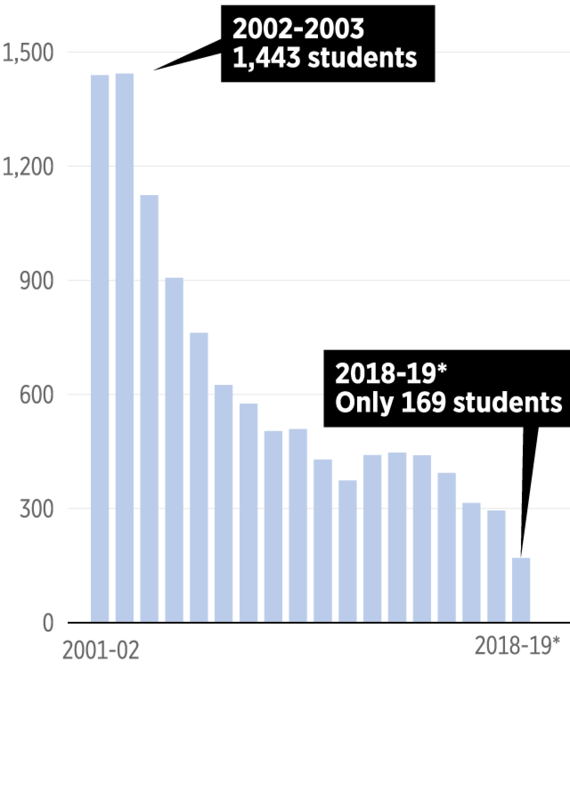 Some students, the administration discovered this year, had taken nine electives before their senior year — double the number they needed for graduation — at the expense of required courses. Like many Mansion teachers, Del Bosque is not much older than her students. She graduated from Yale University in 2017 and came to Mansion via Teach for America. Del Bosque feels deeply connected to the school and its students, but that winter day was considering leaving Philadelphia at the end of the school year because of family circumstances. 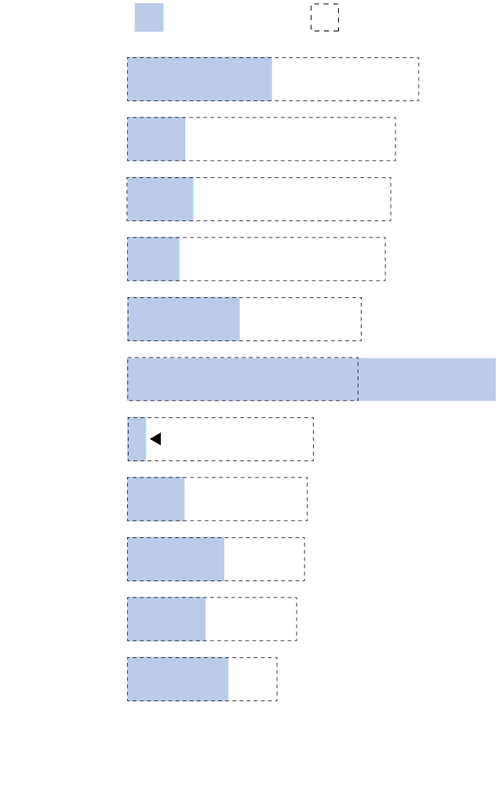 Turnover is a constant problem: Fewer than half of Mansion’s 20 teachers were there last year. Seven are first-year teachers. Del Bosque glows when she talks about what her students are capable of, even the ones who carry heavy loads and seem unreachable. One student, she said, came in every day with her head down, sat on the radiator, and refused to budge. But the young woman aced her benchmark test, a district-wide check of students’ learning. “People have these expectations for us, and we’re exceeding them every day,” said Del Bosque. The adults in the building know that labels matter. Mansion students who flunked the Keystone Exams could still graduate, since Pennsylvania paused its plan to require high schoolers to pass, but Sullivan and McCracken offered prep sessions and pushed the students to retake the test. District officials have promised to give Mansion time to stabilize and to keep supports in place while it does so. They say that neighborhood fears that the school will be closed — its students scattered and its building sold amid some early signs of rising property values in Strawberry Mansion — will not materialize. But school turnaround is slow, arduous work, and Mansion still has academic and personnel challenges, in addition to the issues inherent in its neighborhood: one teacher quit midyear, and one teaching position was never filled. (The class has been staffed by a long-term substitute.) One student missed months of classes when he was shot after school not far from the building. 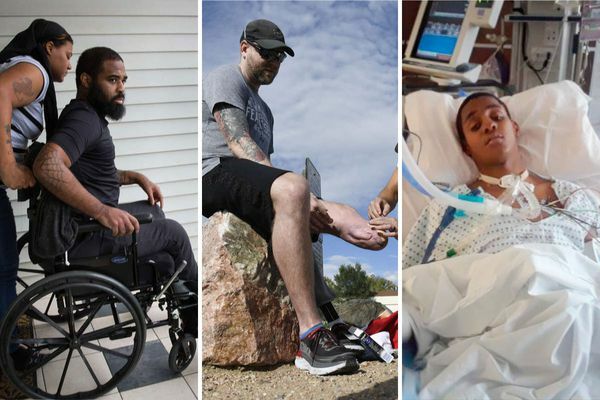 And in November, a stray bullet pierced a third-floor window, causing a school lockdown. On a warm Friday in March, the school drew the spotlight again, this time for good news. With TV cameras rolling, Superintendent William R. Hite Jr., school board members, and others came to announce a $23,000 donation to help expand the school’s burgeoning music program. Also on hand was Clarke, the City Council president and alumnus whose input has been key to Mansion’s fate. But even those rooting for the school’s turnaround don’t believe that success is guaranteed or that it would survive another closure attempt. Strawberry Mansion High School looms over the surrounding neighborhood as the sun rises as pictured from West Fletcher Street in Philadelphia. The hulking building was designed to hold 1,800 students, but currently enrolls 169.